Clip is a reliable mobile payment service that allows merchants to accept credit and debit card payments anytime, anywhere. The application utilizes proprietary technology to transform your mobile devices (smartphone and tablet) into a bank terminal. The mobile payment device offers the flexibility to accept payments securely in the palm of your hand. It revolutionizes mobile payments by allowing both dip and swipe transactions. Clip’s simplicity and payment security liberate you from the hassle and complexities of the customary card acceptance terminals. Its bold design exhibits the freedom brought by mobile payments to merchants and customers alike. The application work in tandem with the card reader to process card payments from all popular credit cards. Clip provides all the tools you need to accept credit/debit card payments and steer your business to success in the emerging markets. It enables you to take your business everywhere and accept payments anywhere, anytime. This is a simple, easy-to-use, and secure mobile payment solution offered as the best alternative to the traditional payments acceptance terminals. The app works in unison with the card reader that is connected to your mobile device via the headphone socket. The application delivers the security your business and customer require. It is PCI-compliant and works to meet the highest international security standards in payment processing. Merchants can rest assured that every transaction is handled in the best way. Customer’s data is also handled with optimal privacy, and every detail is kept safe and confidential. Every Clip partner and team member follows strict security protocols to ensure only the authorized person access sensitive data. Additionally, the Clip reader adheres to EMV standards and regulations. Additionally, all operations performed on the app and the reader are encrypted. 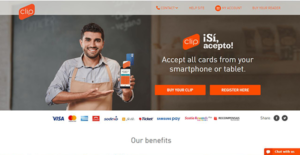 Clip accepts payments from an extensive selection of popular credit and debit cards. Whether it’s Visa, American Express, MasterCard, SiVale, Recompensas, Carnet, Scotia Rewards Plus, and more, clip processes every payment securely and quickly. The merchant dashboard enables users to view and track all transactions. It allows you to access vital tools that spur your business to unprecedented growth. If you are considering Clip it may also be beneficial to analyze other subcategories of Best Mobile Payment Systems gathered in our base of SaaS software reviews. Every business is different, and can require a particular type of Mobile Payment Systems solution that will be designed for their business size, type of clients and employees and even particular niche they support. It's not wise to count on locating a perfect app that will work for every business regardless of their background is. It may be a good idea to read a few Clip reviews first and even then you should pay attention to what the service is intended to do for your business and your staff. Do you need a simple and straightforward app with just essential functions? Will you really make use of the advanced functionalities needed by pros and big enterprises? Are there any particular tools that are especially useful for the industry you operate in? If you ask yourself these questions it will be much easier to find a solid software that will match your budget. How Much Does Clip Cost? Clip’s enterprise pricing model comprises of a one-off fee for the Clip card reader at $580. We realize that when you make a decision to buy Mobile Payment Systems it’s important not only to see how experts evaluate it in their reviews, but also to find out if the real people and companies that buy it are actually satisfied with the product. That’s why we’ve created our behavior-based Customer Satisfaction Algorithm™ that gathers customer reviews, comments and Clip reviews across a wide range of social media sites. The data is then presented in an easy to digest form showing how many people had positive and negative experience with Clip. With that information at hand you should be equipped to make an informed buying decision that you won’t regret. What are Clip pricing details? What integrations are available for Clip? If you need more information about Clip or you simply have a question let us know what you need and we’ll forward your request directly to the vendor.